I despise finishing. It takes the courage of 1,000 strong-willed knitters to force me to tackle any kind of finishing. I've always found this to be an odd personality trait given my general elation with both the finished product and the shorter to-do list. Nothing has better demonstrated my completion aversion than the malabrigo sweater. The yarn for this project followed me home in November of 2005 as a birthday gift from my mother. I cast on immediately and didn't put it down until I had the whole sweater knit about 6 weeks later. After this initial affair, the whole thing was shoved into a dark corner of the stash for another 8 months (putting us comfortably in the month of August, for those that are keeping track). 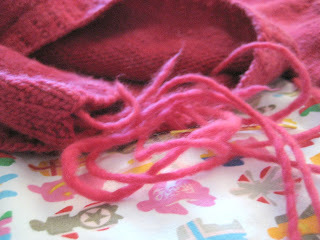 After a half-hearted attempt at setting the sleeves, it was again forgotten. Spurred on by the cool weather in late October, I struggled through half of the finishing then gave up until just now. Spurred on by this month's project spectrum colours, I finally locked myself into a distraction-free zone and forced my way through the seaming last night (over a year after completing the knitting). Now there are ends to weave in and I feel my interest waning once again. The additional evidence suggests that my aversion to finishing isn't knitting specific. It also taints my legal studies. I am fortunate enough to be in the final semester of a twenty-year education. One would think that after a particularly gruelling three-year stint in law school, I would be raring to finish my studying and move on with my life. 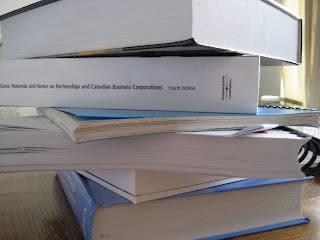 The pristine, above-pictured books suggest otherwise. For better or for worse, one more week and I'll be through the worst of both. Posted by Amanda at 4:04 p.m.
Is the malabrigo sweater awesome? Will you be able to wear it sometime soon? I tend to procrastinate on my finishing too, which is why about six snips into the Venezia I was like "wait a minute what am I doing?!" You can do like I do, and save the ends as trophies. I have quite a pile accumulated from the sleeves of Venezia alone. April 11, 2007 at 10:38 p.m.